Capstone Turbine Corporation (NASDAQ: CPST), announced that it has received a 150 unit order for C30 Capstone MicroTurbines(R) to be deployed in ECOSaver IV hybrid electric buses manufactured by DesignLine International. This is the largest order to date for Capstone products in a Hybrid Electric Vehicle (HEV) application. Hybrid electric buses equipped with Capstone microturbines, have been operating in various parts of the world for approximately 10 years. 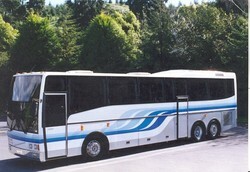 DesignLine buses are constructed with advanced extruded aluminum technology making them lightweight and very strong. The end result is the most fuel efficient vehicle available. In recent product demonstrations the ECOSaver IV hybrid buses equipped capstone turbines have seen up to a 100% improvement in fuel economy over a traditional diesel bus which equates to fuel savings of up to 6,000 gallons per year according to DesignLine. The bus has a serial drive, running on batteries all the time, the turbine being only used to charge the batteries The buses are also equipped with regenerative braking. In urban driving the buses get about seven miles per gallon. The buses were tested by the New York Metropolitan Transportation Authority for two month beginning in October 2007. Standard nominal specification are: Top speed: 62 mph, Max gradient: 15%, Max Power: 250 KW, Max Torque: 2500 NM which may change depending on configuration selected. A string of 40 standard 12V sealed gel lead acid batteries batteries are connected together to form a 480V battery pack. The standard 42 AH battery pack stores 40 kWh of energy while the 70 Ah battery pack stores 67 kWh of energy. If a full battery pack of 42Ah batteries is used, the bus has a range of 18.6 miles on battery only, while if a full battery pack of 70Ah batteries is used, the bus has a range of 31 miles on battery only. The batteries power 3 phase AC induction motors. Super/ultra capacitors provide the initial power for the acceleration and absorb the energy from the regenerative breaking. A Single Moving Part - A single turbine/compressor shaft with integrated generator. Patented Air Bearings - The single moving part rides on a cushion of air. Consequently, Capstone MicroTurbines(R) never need oil or lubrication maintenance. Air Cooled - No radiator, water pump, thermostat, hoses, belts or external accessories. During zero emission mode the noise level is near zero and with the Capstone unit running the noise level is approximately 75% lower than a traditional diesel bus. DesignLine calculates a 40% reduction in overall lifecycle cost compared to a traditional diesel bus. This order calls for shipments through June 2009 to Capstone's new plant in North Carolina. According to this article the 35 passenger buses cost $440,000. Headquartered in Charlotte, North Carolina, with manufacturing facilities in Charlotte and Ashburton, New Zealand, DesignLine was established in 1985 and produces high quality coaches, buses and specialty vehicles for the worldwide market with particular focus on its industry leading ECOSaver IV hybrid vehicle. A valid question would be if a serial hybrid bus like this but with a highly efficient diesel genset would be better. I think the answer is yes. The data sheet for the C30 microturbine states that its heat rate is 12,700 BTU per kWhr of mechanical output power, or just under 27% efficiency. An optimized diesel engine can do signficantly better. From a system point of view, a lighter vehicle helps efficiency. The turbine no doubt is lighter than a diesel engine, but the difference that would make in total weight of the bus is not very much. The DOE has a program to increase microturbine efficiency to about 40%, which is similar to the efficiency of a modern small diesel generator. The microturbine is probably a bit more expensive, and it can't be more robust than a diesel. In the other thread, someone mentioned thee-traction bus gets even better mileage. HTML links don't appear to work anymore? That's pretty daft. It looks like you left out the href. Looks fine in the preview. I wonder if it would be practical to put electric contacts above the bus at some stops. Perhaps the bus could receive a quick charge from these stops when its waiting on passengers. The question is, what type of engine is best for a serial hybrid, and does this vary from a bus to a car? External combustion, microturbines, Wankels, or Fuel Cells? I have read that Wankels could be optimum for some series hybid applications. I think the reason why turbine used is, that gas turbines have been tried as (road) vehicel use, but their slow response to higher rpm request made them unuseful in street traffic. With combining in a serial hibrid this factor has been solved, and also the energy buffering can save a lot. Which possibly makes a turbine's less efficeincy still viable. Despite that, a diesel-electric serial hibrid would be more fuel efficient, but probably with a correspondingly higher production cost. Turbines have very high angular momentum and resist turning. When considering the coefficient of friction of POV tires on wet pavement, this is not a very desirable handling characteristic. This may not be an issue for city buses. I don't think microturbines are cheaper than diesels. IIRC microturbines cost more than $ 500 per kW. Diesels are much, much cheaper. "...if a full battery pack of 70Ah batteries is used, the bus has a range of 31 miles on battery only...."
Sounds like there is an opening for all electric buses utilizing exchangeable battery packs. Remember that a diesel operates at 40% efficiency in a very narrow range and that 40% is just the thermal efficiency value. Another consideration is the mechanical efficiency of the engine itself (e.g. a lot of losses to friction in the cylindar walls, crank bearings, valve train, etc.). Turbines have a very high ME value which helps to partially compensate for its low(er) TE value. Diesels have a low specific power compared to turbines. Consider that optimum speed for a diesel is around 2000rpm and it becomes evident that the diesel engine will have to be considerably larger and heavier than a micro-turbine. The ability to use natural gas is a plus. Cheaper than diesel on a $/BTU basis. Lower emissions to boot. 2. Maintenance/Reliability. These micro-turbines use are bearings and will essentially last forever with practically no maintenance. BTW does anyone else wonder why the rear wheels aren't partially covered to enhance aerodynamics? While I'm at it, how about some turbulators along the side. Just drop the Cd a little on these behemoths and it would make a huge difference. I wonder if it's practical to add steam boiler and steam turbine to achieve some extra "cogeneration" power. No doubt that it would add weight and complexity. The complete turbine system efficiency would go to around 50%. I couldn't find any data on diesel generator efficiency, any link? I'm wondering about "diesel to generator to electric motor to wheel" vs "diesel ICE" efficiency. Remember that a diesel operates at 40% efficiency in a very narrow range and that 40% is just the thermal efficiency value. It's a genset, which runs at (near) peak efficiency all the time, and the net peak efficiency of a diesel is still better than the net peak efficiency of a microturbine. Diesels have a low specific power compared to turbines. Both are lightweight, because little genset capacity is needed (serial drive, only maximum average load required). Sure, if you've got the NG infrastructure for fuelling. Cheaper, yes, cleaner well it's not a big difference if the diesel has a particulate filter and a nox catalyst. It's a serial hybrid drive, so not really a big deal anyway. Modern diesels are silent. Modern diesels are robust enough for mobile apps. Microturbines are not better for mobile apps. If you are going to run natural gas, you can do better than a microturbine with either an optimized lean-burn spark ignition reciprocating engine, or you can mix natural gas with the air going into the diesel engine and use a bit of diesel fuel injection as the combustion initiator. The latter method produces low particulates and minimizes the use diesel fuel. Also, the system allows the engine to return to conventional diesel fuel operation if the natural gas should run out. No need to oversize the natural gas storage system. That's a good point, ICE optimized for NG could be very efficient, considering the high octane number of methane. I think substituting some imported oil for imported natural gas is an improvement. Diversifying will lower the risk of peak oil problems and NG supplies may be a bit less tight than oil supplies. So building more NG refuelling stations could be a good investment, it's proven technology at a reasonable cost. re "Turbines have very high angular momentum and resist turning. When considering the coefficient of friction of POV tires on wet pavement, this is not a very desirable handling characteristic". What is the North Carolina address and contact information for DesignLine? Then click on the "About Us" page, then the "Contact Us" in the upper right of the page. Just a note Capstone has a vehicle engine called IRC 225. It has up to 42% efficiency. The engine operates at 75kWh to conserve fuel but has immediate power of 225kWh available. i think you mean 75kw and 225kw....not kwh. The wrong unti was used in the article as well. a 480v 42AH battery doesnt store 40kwh. they both can produce 40kw and 70kw respectively. I wish I could take the bus, I'm way too afraid though. runescape gold of RS Online Game, we have made several changes to Fun Orb. Rom Gold which I have spent much more in this game it is necessary. Powerleveling-Runescape.net is a professional Runescape powerleveling Service site for Runescape player.You can buy rs gold and runescape item and runescape items service..
service.You can come and have a look! service.You can come and have a look!Thank you! Powerleveling-Runescape.net is a professional Runescape powerleveling Service site for Runescape player.You can buy runescape money and cheap runescape gold and rs money service. The total cost of ownership for turbines can be considered compared to diesel engines. Since there is no lubrication and no cooling system required for the microturbines and they have very long life a few more percentage points of efficiency may not be worth using the diesel. Capstone has not yet been able to make the single moving part feature cheap enough to compete with diesels with many moving parts, but somebody in the future will be able to do so. Bus stop charging and ZEBRA batteries could make this vehicle into a first class plug-in-electric hybrid, but so much money is paid for the turbine it ought to be used. ..HG.. This would be a very good vehicle to demonstrate EFFPOWER batteries. ..HG..
Henry Gibson. The turbines are unlikely to be cheaper than diesels. Even HUGE Brayton cycles with lots of economy of plant scale(100,000+ kW) are neither cheaper nor more efficient than a diesel. Brayton cycles have an inherently higher cost structure due to more demanding materials requirements and much more complex engineering in general. As Donb points out above, a hybrid natural gas/diesel engine is probably the way to go. Mostly natural gas, so it's lower fuel costs, and you still get large emissions reductions. When it comes to future techs, the SOFC has a strong hand, especially for the serial hybrid market. It should beat microturbines as well as diesels on cost and efficiency. I'd be curious to know what the operation is like once the batteries are fully discharged -- i.e. when you can only use as much power as the 40 hp microturbine (minus electrical generating losses) can produce. Red wine and certain polyphenolic substances in red wine such as resveratrol may help prevent heart and arterial disease. According to the "French Paradox," moderate red wine consumption benefits the heart, increases levels of "good" cholesterol, protects against artery damage and fights free radicals. This information in this blog is very complete, showing photos help identify places that are spoken and I feel very good, thanks for that! I used to think that the electric car would be the thing of the future but they just can't seem to get the power. this part of blog "The measure, opposed by private lenders and critics of an expanding federal government, was included in a package of proposed changes to an overhaul of the U.S. healthcare system." was very interesting, thank you! Some time i will see you blog are so good ~ i will often you site~! thank you ~! The measure, opposed by private lenders and critics of an expanding federal government, was included in a package of proposed changes to an overhaul of the U.S. ....! !